I’m in New York City for the weekend for some touristy stuff thus my missing a photo post or two for a few days now. 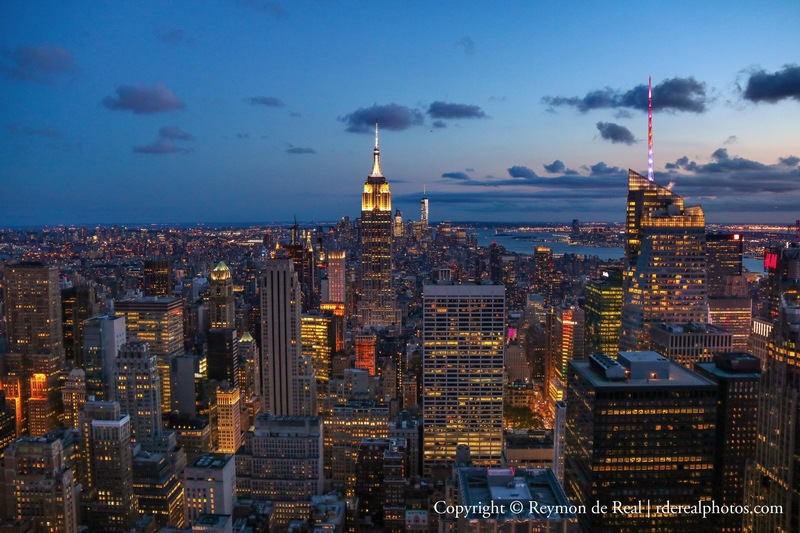 Yesterday, I revisited the top of the Rockefeller Center to photograph the NYC sunset. After lining up for ages, walking through a labyrinth of walls and riding the speedy elevator to the 67th floor…I finally made it to the first ledge of the observatory. The observatory provided me with a 360-degree view of the city, however, I decided to focus my camera on the southern side of Manhattan to capture the Empire State Building and the new World Trade Tower just as the sun was setting. The view from the top was amazing and viewing it during twilight was such a breathtaking experience. It was also awesome to see the city lights slowly turn on one by one like Christmas lights on a tree just as the cloudy skies slowly turned darker each passing minute. I took a number of photos and this one turned out to be my personal favorite. I hope you guys like it too…would appreciate your feedback. Thanks. Nice new york photos reymon. I too like twilight the balance of manmade lighting to natures can be awesome! Thank you! I think it has something to do with the shadows…helps create depth and dimension. Hard to beat the sharpness, must have been no smog that day. You need good lenses and big sensors to get it-and a steady hand. Thanks! I was able to keep my camera steady on the glass partitions. It was a beautiful day as well so everything was clear from the Top of the Rock. One solid view of nothing but just pure amazement. Superb capture this is, Reymon. Your photos often seem to be so clear with lots of crisp details in focus. How do you accomplish that so often? Great equipment, great skills, both, or something else? Very pretty. Hi! The crisp and clean ones are taken using my Canon DSLR…the not so clear ones are usually taken with my iPhone. It also helps if you keep the camera as stable as possible when taking photos to control the blur. The Power Shot is between the point-and-shoot and the DSLR. I have a DSLR which captures more detail and colors. I got my first DSLR (Canon Rebel XSi) for a bargain at B&H photo (www.bhphotovideo.com). In fact, it was buy one get one 50% off…my sister was so happy when I gave her the other camera. Try checking out their online store for deals. Hey, thanks for the idea! Thank you, Miriam! Gladly it did not rain that night. I skipped a boat ride around Manhattan last night coz of thunderstorms so no skyline pictures from me…and this was the second time this happened. Bummer!